Here is the conclusion of our coloring book about the days of Creation. In each picture Mandy has tried to illustrate the events in a way that shows the goodness of God. If you enjoy these free resources, leave a comment to encourage her. Directions: To use this coloring sheet in your ministry, school, or home – simply click on the image above to download as a printer friendly PDF file. You can also download these as a large JPEG image (745K) if you want to do advanced editing. This coloring page shows creation day seven, when God had completed all his work. You see Adam & Eve resting in the garden God made for them to enjoy. There is a river running down the center of the picture. 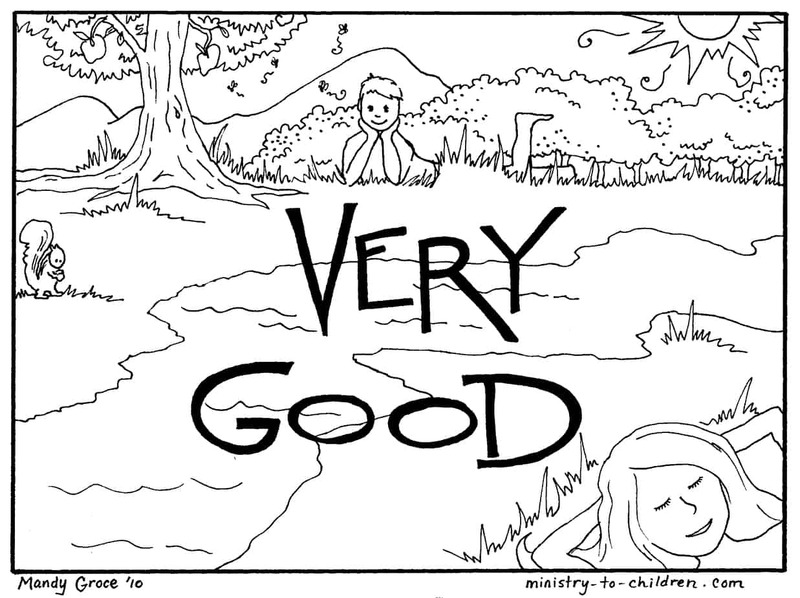 The words “Very Good” are centered in the coloring sheet. Need More Coloring Pages? Browse all our Sunday School Coloring Pages or see more of our free creation coloring pages. We also have a growing selection of Sunday School Crafts. Hi my name is wonder i’m from Glad Tidings church Zimbabwe. Thank you a lot for the lessons on the creation, my sunday school has benefited a lot. With the images it has made it easy to comprehend. Thank you and my God continue to bless you abuntantly. Enjoyed using these coloring pages on the creation with pre-K and kindergarten children in our study of creation during our church’s camp. Thank you for making them available. May God bless each and everyone is this “God-send” ministry. I have referred to it so many times in helping me plan my Children’s Church and Sunday School lessons. May he continues to “open up the windows of heaven and pour (each and everyone of you all) his blessings that you won’t have room enough to receive”. Praise the Lord! God’s little (and big) angels are and still are LEARNING so much from your ministry. Thanky you all for making it possible for all of us!!! Bless you for making these creation coloring pages available! Thanks Mandy for sharing your talent! The children in my K-3 God’s Kids class will enjoy coloring these pages which will then help us tell the creation story. Thank you! I am on the look-out for simple drawings to use to decorate our preschool classroom. We have 7 cupboard doors that we are going to paint… and I think I might be able to use these to depict for the kids, the week of creation…. Thank you for doing these, and for making them available.